It was a cultural experience to say the least. 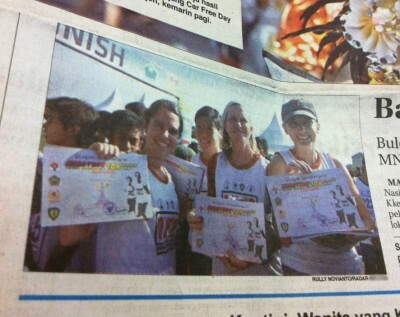 Some of my fellow American (or “bule”) friends and I decided to join our city in a local Marathon/10K race. We knew it would be different than any race we had run before, and we were not disappointed! 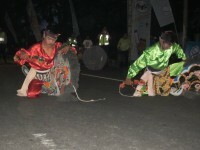 The pre-race entertainment was “Gamelan” or traditional music and dancing. The race got underway nearly an hour late…”Asian time”. It was a fun race with lots of people there. Rather than bibs, we were given tank tops with our number screen printed on the shirt. This made everyone match…which is something people like to do a lot here! I also saw people running in all kinds of shoes, from cleats to casual shoes to bare feet and socks. The 8 of us were pretty much the only non-Asians around. We definitely stood out. We finished the race and started to head home when a race official chased us. “Stop! You have to come back!” he said in broken English. We explained that we needed to go home but thanked him for his invitation. “No, you must come back!” He said. After quite a bit of coaxing we finally gave in and walked our way back toward the finish line. They sat us in fancy chairs covered in white table cloths and served us drinks. “Wait here,” they said. We waited, knowing full well that the only reason we sat there was because we were bule. 15 minutes later they lined us all up. A crowd gathered around us as they announced us and gave us gifts and awards. We proceeded to shake hands with some apparently important people. I felt as if the paparazzi were there with a line of people snapping photos. But why? We did not win. For the locals from this region, it was a great honor to have white people participate in their race. It was a struggle for me as I couldn’t help but ask myself some difficult questions. Why do they see me as different from them? Or moreover, why do they not see themselves as highly as I see them? Why am I considered special due to the color of my skin? I have to say, I was honored to stand next to a man in his 70s who ran the race. He was adorable, and so strong! 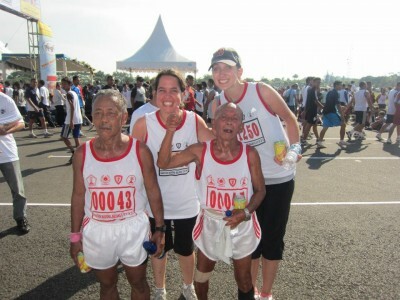 "Bules participate in 10K race"